The EyeTV Remote app for iPhone and iPad provides fast reliable control of your Eye-TV device on Mac OS-X. No more searching for the remote, as everyone in the family can have one on their phone or iPad. EyeTV Remote app uses your wireless network so it doesn't suffer the drawbacks of infra-red controllers. EyeTV Remote app can be used from any room in your house, or the convenience of your arm chair. The large buttons are easy to find on the table, and you can adjust the button sensitivity to avoid accidental taps as you fumble for your phone in between the beer and peanuts. A single tap gets you commonly used actions. 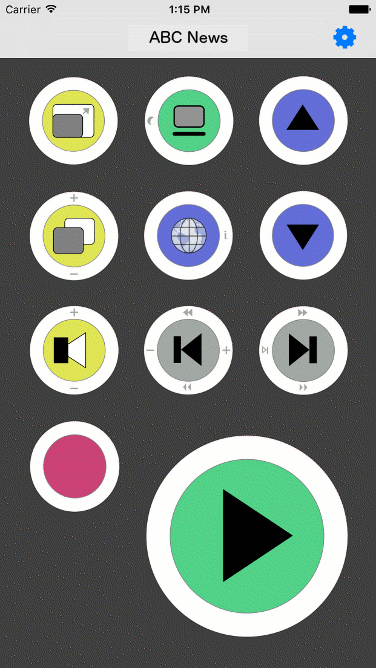 Swipe buttons up, down, left or right for less used functions. The help screen explains the functionality of each button in full. Open, close, rotate, maximize player windows. Free companion software must be installed onto the OS-X computer running the EyeTV software. If you are upgrading on OS-X 10.10 or earlier you should first stop the server software from within System Preferences. Download the JazzRemoteServer package and open it on the computer you wish to control (ie. the computer with the EyeTV software). It will install the server software and a System Preference Panel to control the server. Check the server is running from the Jazz Remote System Preferences Panel. If you are using OS-X 10.10 or earlier you will need to manually start the server. You must also purchase and install the EyeTV Remote App from the iTunes store. Should you have issues with any part of the process, please contact us and we will be happy to assist. ©2016-2019 Jazz Media Pty Ltd. This project is not affiliated with Geniatech nor Elgato Systems. EyeTV is a trademark of Elgato Systems and/or Geniatech.